In a pressure cooker, first add the pork meat. On top of the meat , layer with the chopped onions, garlic, ginger and tomatoes. Sprinkle chill powder, turmeric and salt on top and add 1 cup of water. Cover the pressure cooker and cook for 10 mins till the meat becomes tender. Switch of the gas, release the steam from the cooker and open the pressure cooker. The gravy will be watery when you check the meat. Add the chunks of Iskus to the meat, mix well. Put the pressure cooker cover again and pressure cook for another 10 mins. No additional water is required. Switch of the gas and let the pork and Iskus steam inside the pressure cooker. After 5-10 mins , open the cooker , gentle mix so that the iskus pieces do not become mushy. 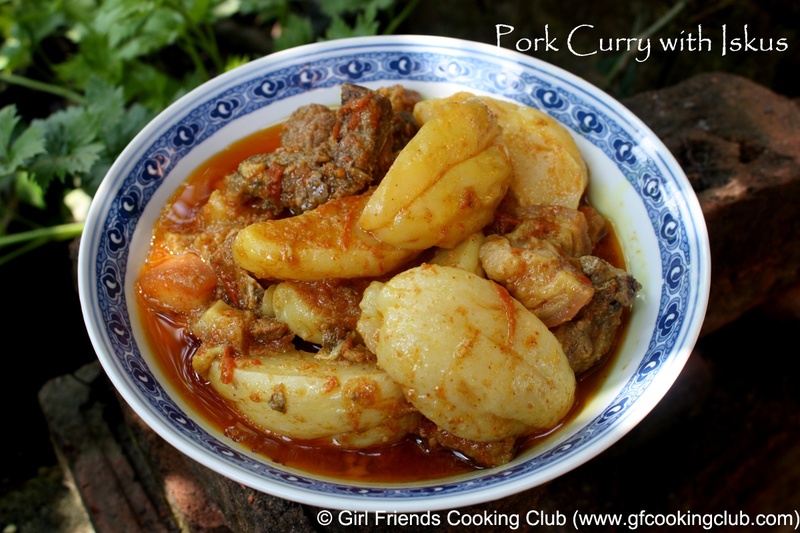 This entry was posted in All Recipes, Nepali Food Recipes, Pork and tagged Nepali Recipes, Pork and Iskus Curry by Kamakshi. Bookmark the permalink.